This statistic shows the result of a survey on Finns' opinions on Donald Trump's influence on political debate and social media hate speech as of June 2018. 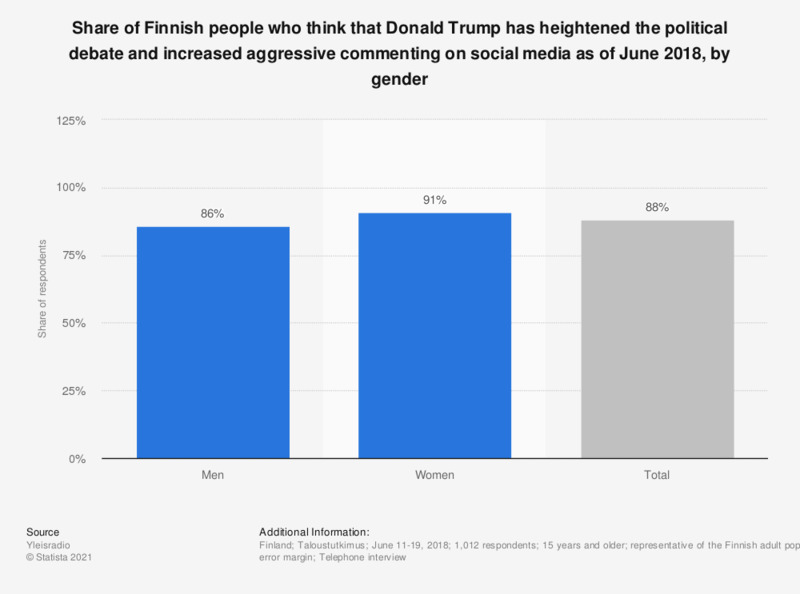 According to the survey, 88 percent of survey respondents (representative of the Finnish adult population) believed that Trump had heightened the political debate and increased aggressive commenting on social media. The survey was conducted prior to the Helsinki Summit where Donald Trump met with the Russian president Vladimir Putin on July 16, 2018. Survey respondents were asked on which factors, in their opinion, Donald Trump has influenced. This question was phrased by the source as follows: "Kärjistänyt yhteiskunnallista keskustelua ja lisännyt aggressiivista kommentointia sosiaalisessa mediassa." One year after his inauguration, how do you rate the presidency of Donald Trump in the United States? How confident are you in Donald Trump’s ability to handle the economy effectively?